Cleveland Browns quarterback Johnny Manziel was at the center of a fight in a Cleveland hotel/apartment building early Saturday morning. Cleveland Browns quarterback Johnny Manziel and his entourage were involved in a fight in a Cleveland hotel and apartment building early Saturday morning, according to a police report obtained by Cleveland Scene. No arrests were made in the incident, and Manziel is not listed as a suspect in the police report. According to the report, when police arrived at the Metropolitan at the 9 at 2:36 a.m., the alleged victim, 33-year-old Chris Gonos, told them that he had been assaulted by "Johnny Football and his entourage." Manziel's agent Erik Burkhardt denied the quarterback was with an entourage and gave an alternate account of the incident. "Johnny and his roommate had been out to dinner earlier in the evening with Johnny's mother, who is staying with him this week," Burkhardt said in a statement to Mike Garafolo of Fox Sports 1. "There was no entourage. Johnny and his roommate were trying to get on the apartment elevator at his home when they were accosted by a very aggressive man and his associates. It was an unfortunate situation and he immediately let [Browns general manager] Ray Farmer and the team know what happened." The Cleveland Scene report, which details Gono's accounts, says that while waiting for an elevator with his girlfriend, Gonos saw a man he believed to be Manziel and approached him, telling him, "I'm the biggest Browns fan ever, I love you, I want to give you a hug." Gonos says at that point he was struck in the face several times by a man who was with Manziel. Gonos said several other men then "pushed and attacked" him until a hotel staff member broke up the fight. The staff member was also hit in the face. Gonos told Cleveland Scene that his brother tackled Manziel and another member of his group "smashed" Manziel in his face. According to Gonos, Manziel retaliated by "sucker punching" Gonos' brother while he was being held by a security guard. ESPN's Jeremy Fowler, who also obtained the police report, said there is video footage of the incident. "We are aware of the incident and are in the process of gathering additional information in order to gain a complete understanding of what occurred. Nonetheless, the time of the incident is concerning to us. We continually stress to all of our players the importance of sound decision making in an effort to avoid putting themselves in these types of situations. We have addressed this appropriately with the player and will have no further comment at this time." 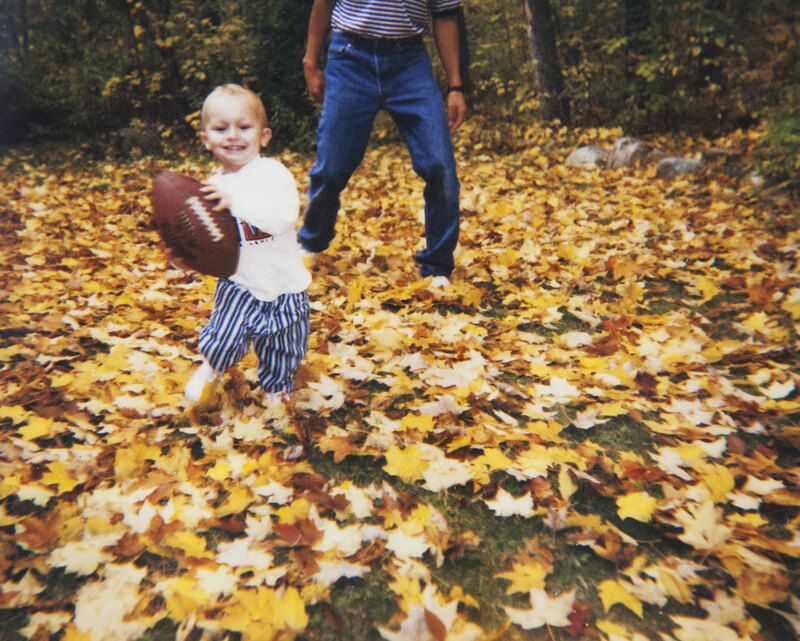 A 1 1/2-year-old Johnny Manziel looks poised to play football. 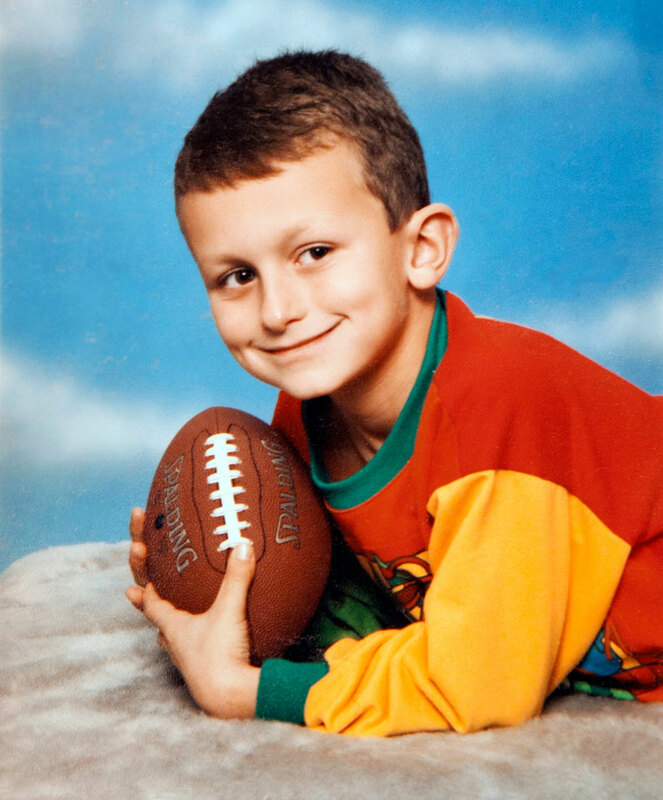 Johnny Manziel at 4 years old, holding a football in his hands. 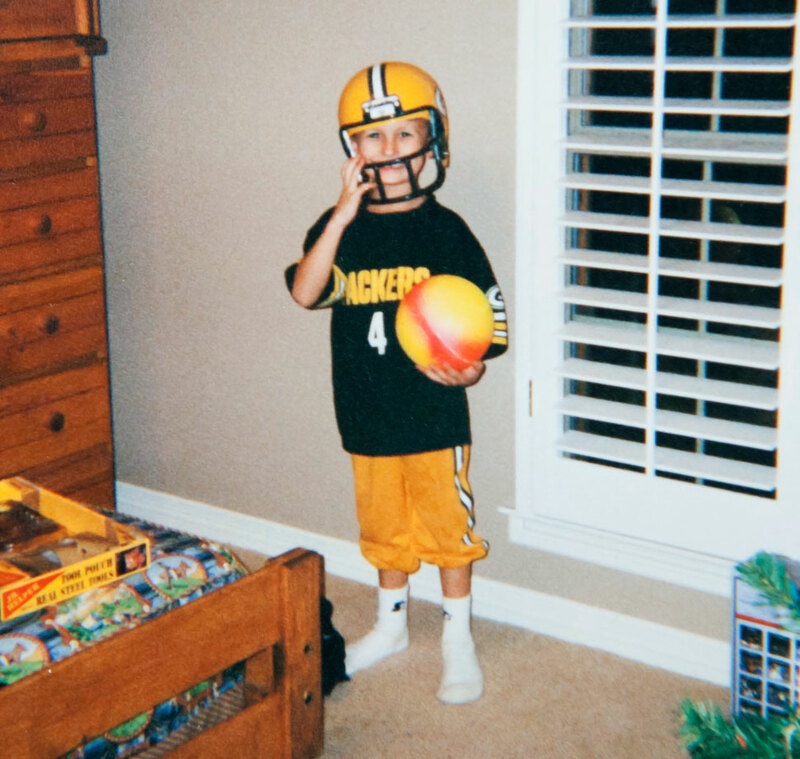 Johnny Manziel, age 4, shows off his allegiance to the Packers. 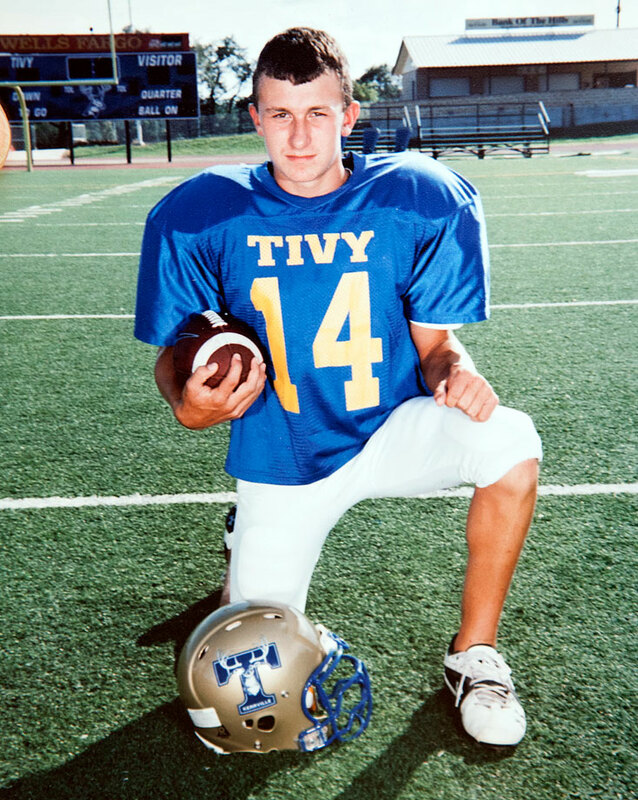 Johnny Manziel poses in pads while playing for Kerrville Tivy High in Kerrville, Texas. 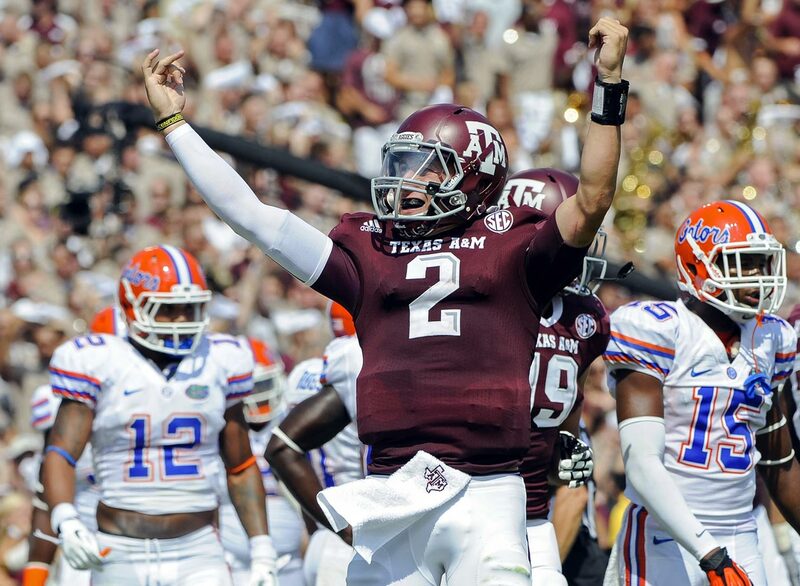 Johnny Manziel celebrates after throwing a touchdown against the Florida Gators on Sept. 8, 2012. 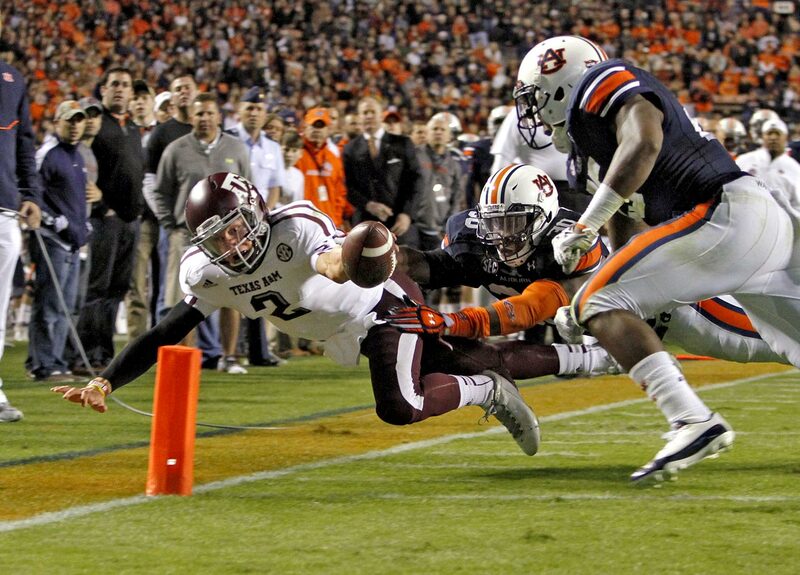 Johnny Manziel dives for a touchdown past Auburn linebackers Cassanova McKinzy and Daren Bates on Oct. 27, 2012. Johnny Manziel runs past Mississippi State defensive lineman Kaleb Eulls for a touchdown in the second quarter against the Bulldogs on Nov. 3, 2012. 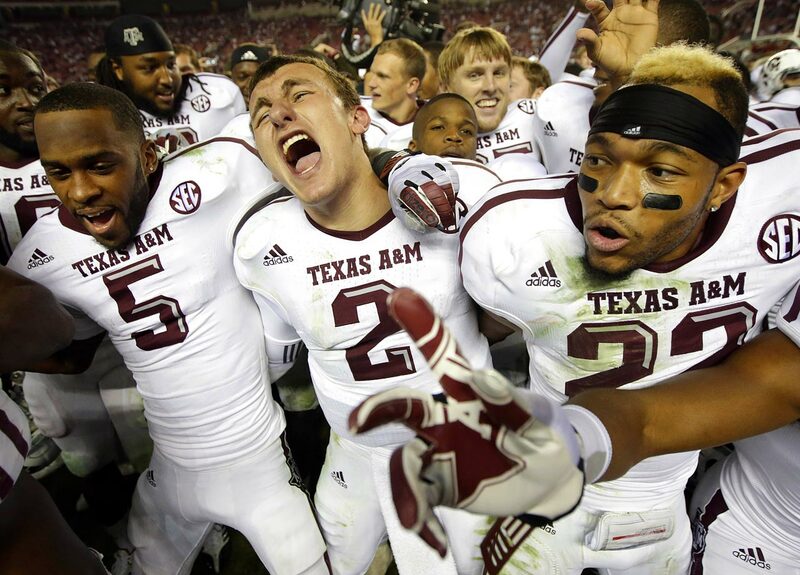 Johnny Manziel celebrates after the Aggies defeated top-ranked Alabama 29-24 at Bryant-Denny Stadium on Nov. 10, 2012. Heisman finalists Collin Klein, Johnny Manziel and Manti Te'o pose with the Heisman Trophy prior to the announcement of the winner on Dec. 8, 2012 in New York City. 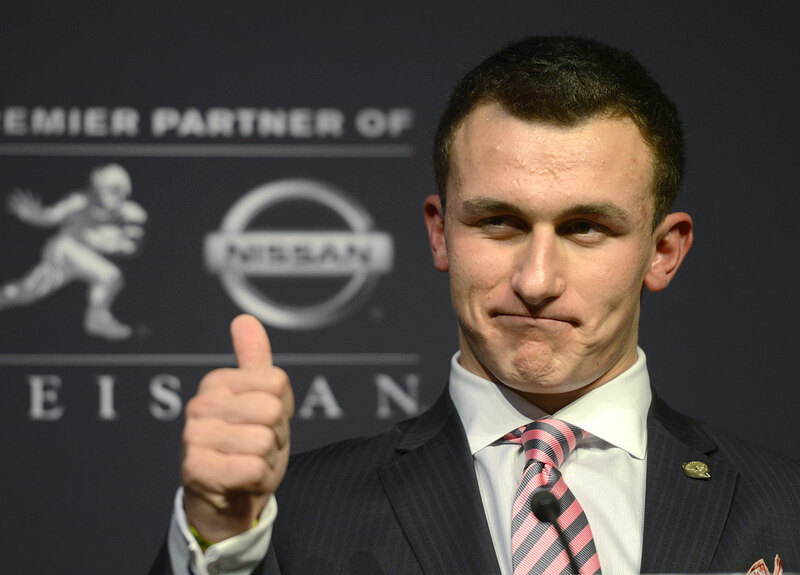 Johnny Manziel gives a thumbs-up after winning the Heisman Trophy on Dec. 8, 2012 in New York City. Soon after, he would also become college football's first freshman to be named AP Player of the Year. "Johnny Football" arrives for the "Late Show with David Letterman" at Ed Sullivan Theater on Dec. 10, 2012 in New York City. 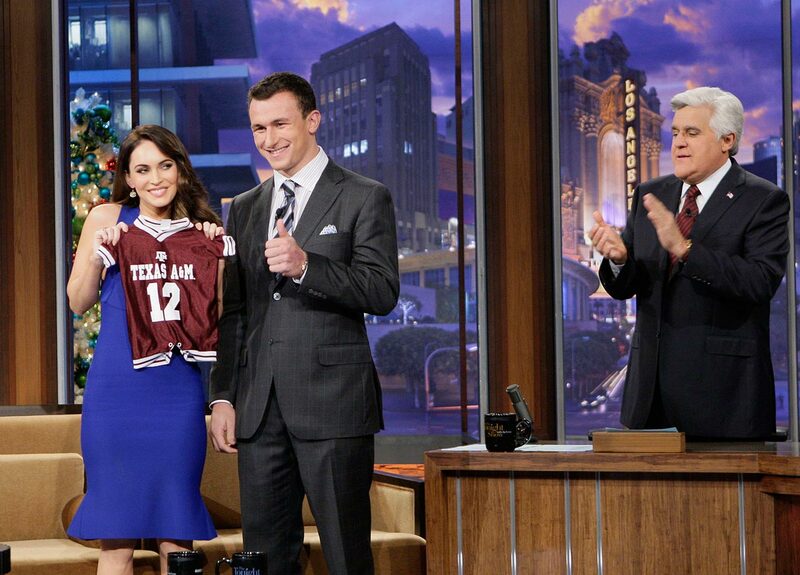 Megan Fox, then a new mother, holds a customized Texas A&M jersey Johnny Manziel gave her while taping "The Tonight Show with Jay Leno" on Dec. 17, 2012 in Burbank, Calif.
Johnny Manziel looks for an opening during Texas A&M's Cotton Bowl game against Oklahoma on Jan. 4, 2013. 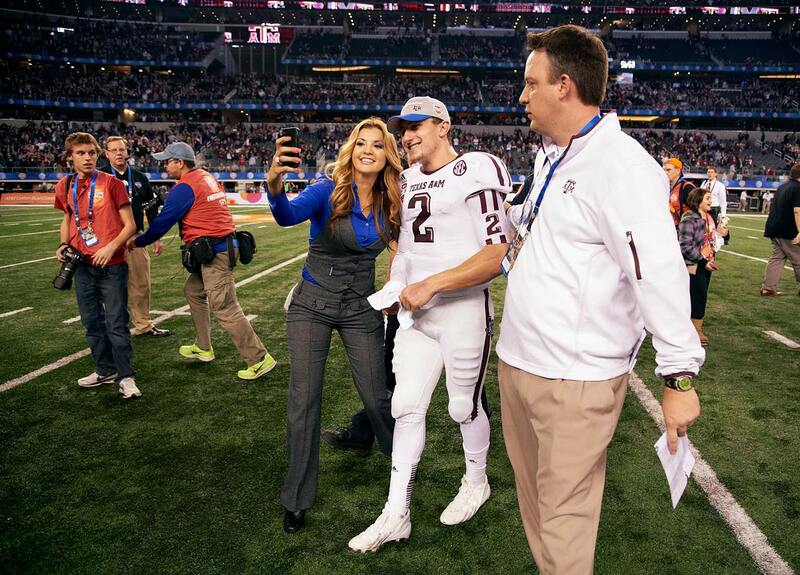 Johnny Manziel stops to pose for a photo with a credentialed fan after Texas A&M beat Oklahoma 41-13 in the Cotton Bowl. 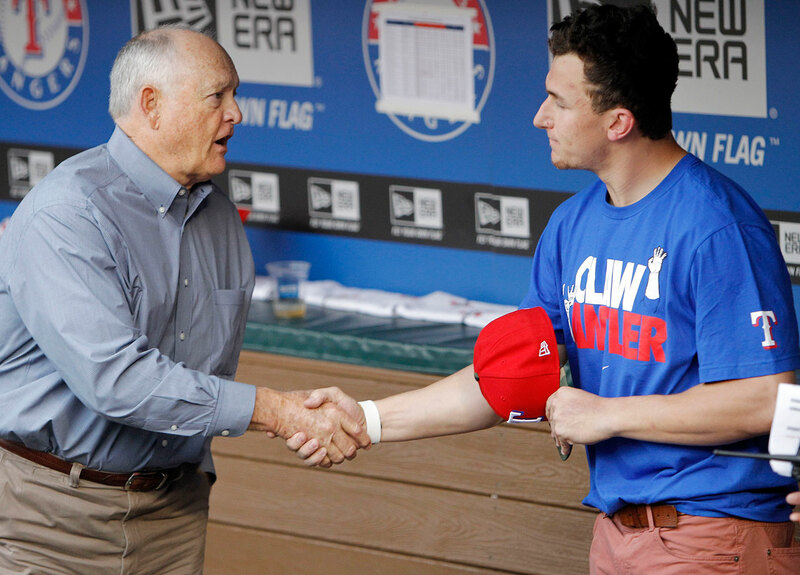 Pitching great and Texas Rangers CEO Nolan Ryan shakes hands with Johnny Manziel. The young quarterback was in Arlington to throw out the first pitch before a game on April 7, 2013. 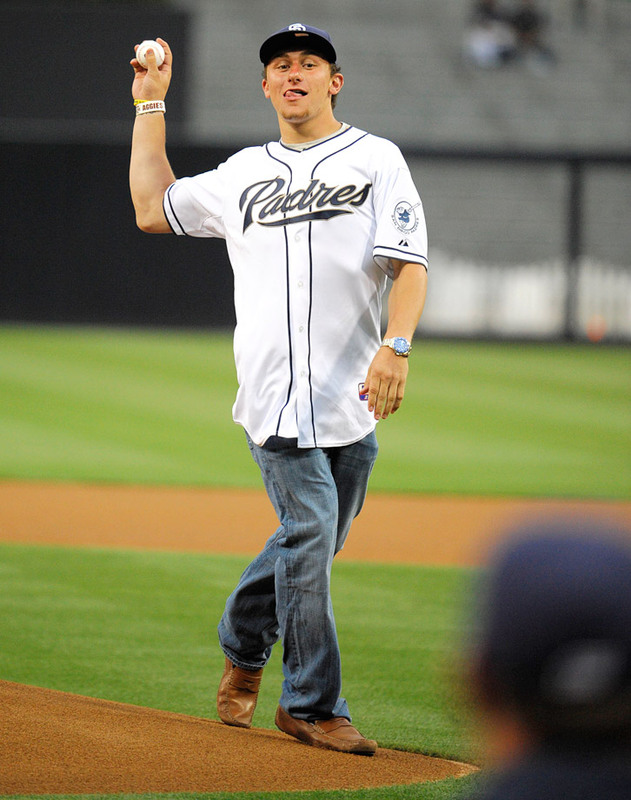 Johnny Manziel throws out the first pitch before a Padres game against the Washington Nationals at Petco Park on May 16, 2013 in San Diego. Manziel was selected by the Padres in the 28th round of the Major League Baseball draft on June 7, 2014 -- the 837th player taken. Johnny Manziel talks with reporters during SEC Media Day in Hoover, Ala., on July 16, 2013. Johnny Manziel listens while Host Jon Hamm speaks onstage at The 2013 ESPY Awards at Nokia Theatre L.A. Live on July 17, 2013. 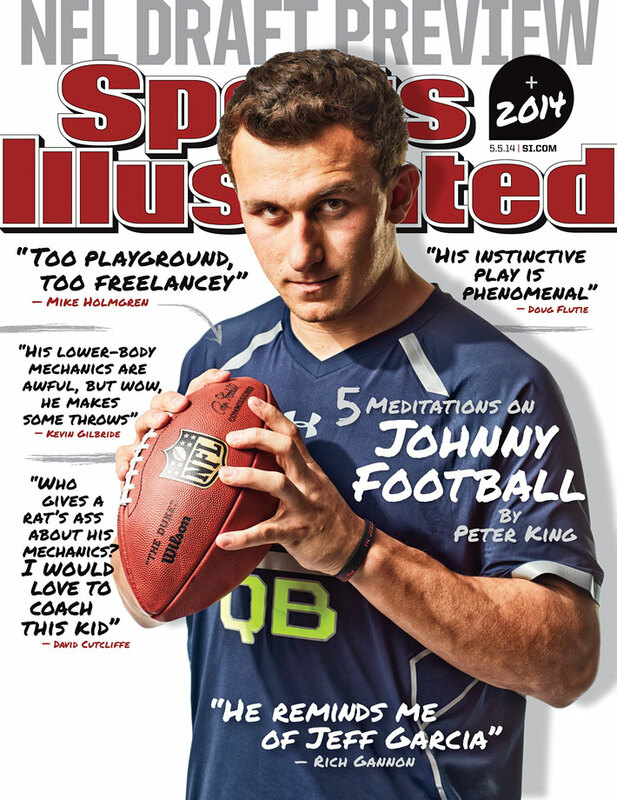 Johnny Manziel appears on the cover of the Aug. 5, 2013 issue of Sports Illustrated. 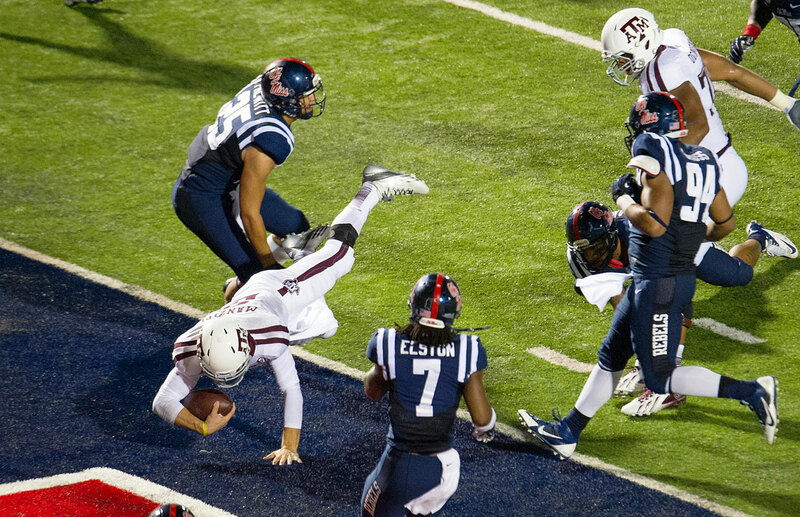 Johnny Manziel dives for a touchdown during Texas A&M's 41-38 win against Ole Miss on Oct. 12, 2013. 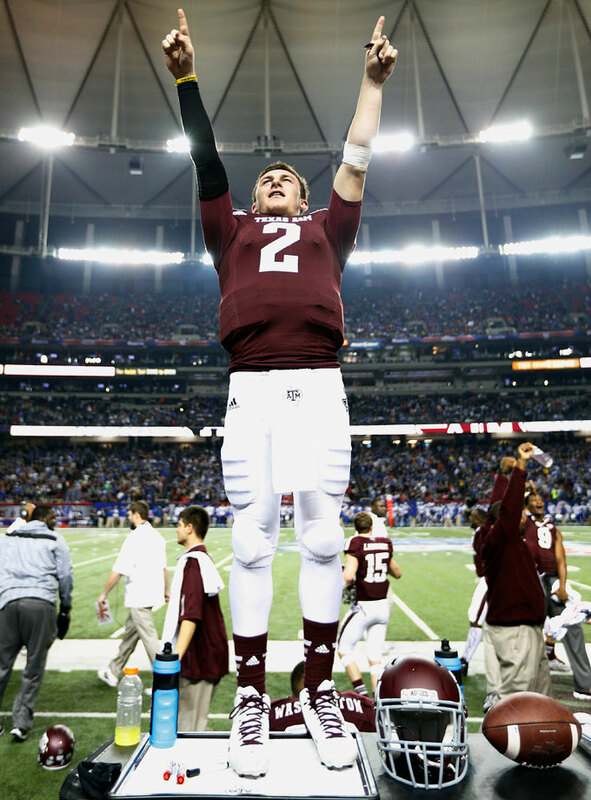 Johnny Manziel celebrates late in the game against the Duke Blue Devils during the Chick-fil-A Bowl on Dec. 31, 2013 at the Georgia Dome in Atlanta. 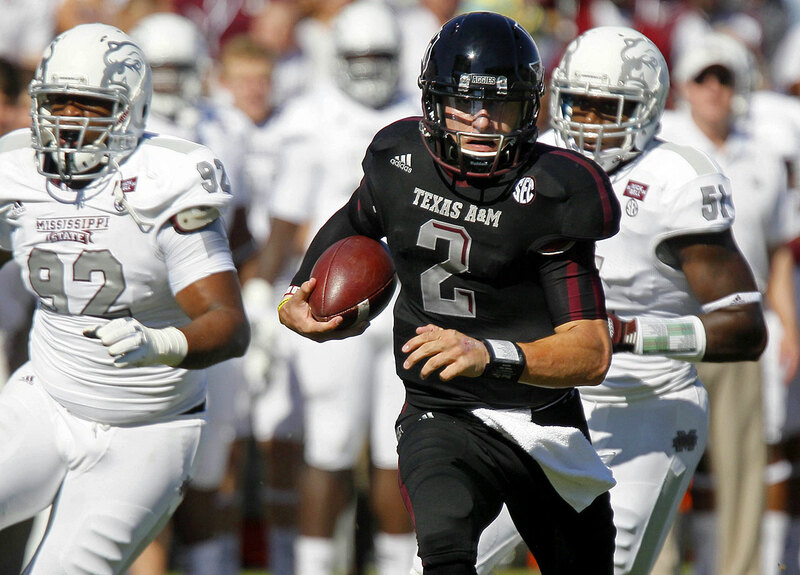 The Aggies were down 38-17 at halftime but with Manziel at the helm they came back to win 52-48. He threw four touchdown passes, completed 30 of 38 passes for 382 yards and ran for 73 yards and a touchdown. It was a pro day like we've never seen before on March 27, 2014. 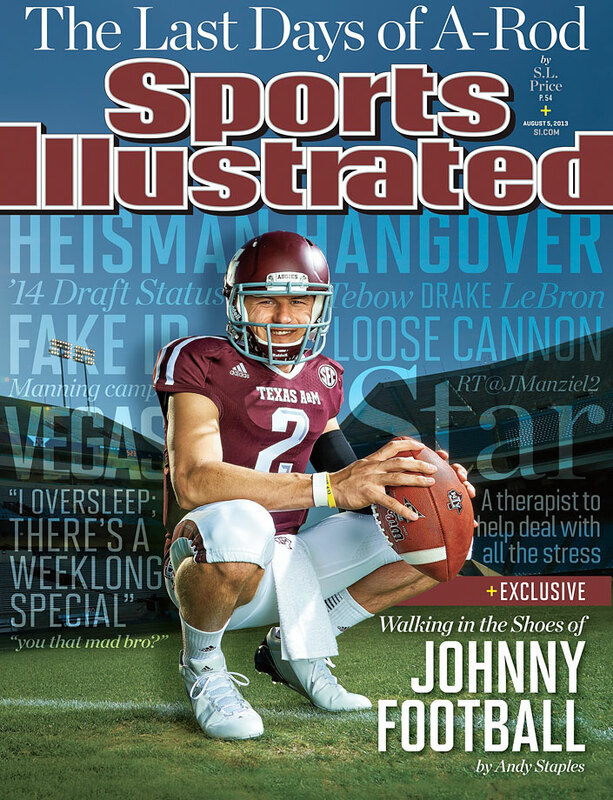 Music from Drake filled Texas A&M's indoor facility as "Johnny Football," who has always scrambled to the beat of his own orchestra, did something no other draft-eligible quarterback had ever done. He went through his group workout for NFL executives, coaches and scouts wearing helmet and shoulder pads. 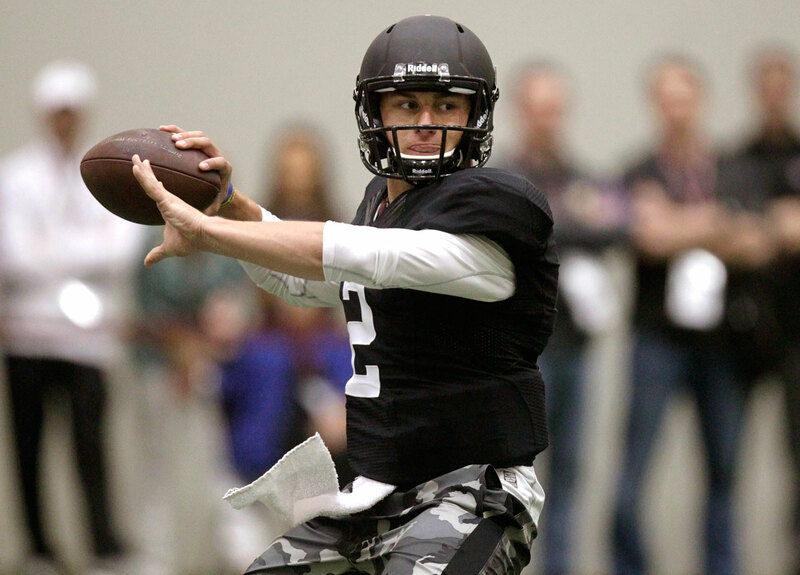 Johnny Manziel wore camouflage shorts and spoke with those in attendance from the NFL before the workout started, to introduce the teammates to whom he'd be throwing. 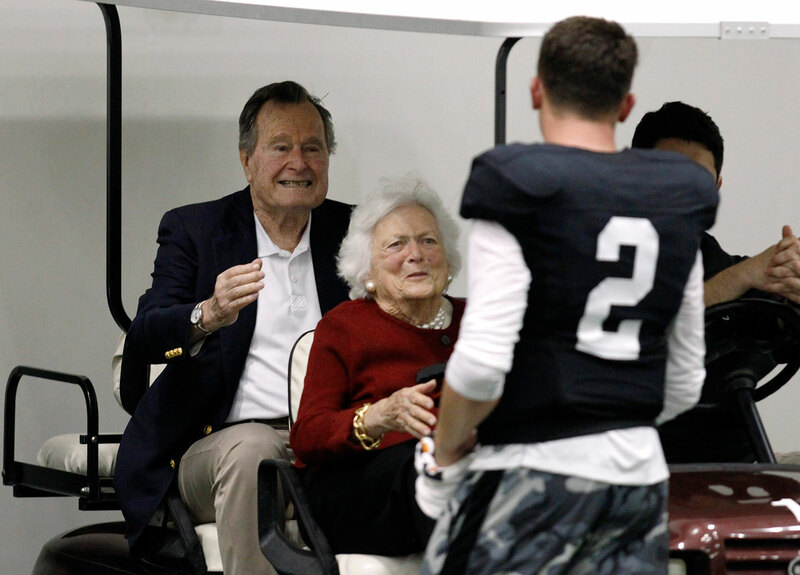 Former President George HW Bush and wife Barbara were in attendance, as was current Texas governor Rick Perry. Representatives from the Texans, Jaguars, Raiders, Vikings and Eagles -- among others -- were also in attendance, adding a football-like feel to the opening ceremonies, as well. The most polarizing figure in the 2014 NFL draft graces the cover of Sports Illustrated's NFL draft preview issue (May 5, 2014). Former Texas A&M quarterback Johnny Manziel had been called everything from a future All-Pro to a bust waiting to happen. What's the reality? TheMMQB's Peter King sat down with five of the best quarterback evaluators in the business to get a definitive read on Johnny Football. 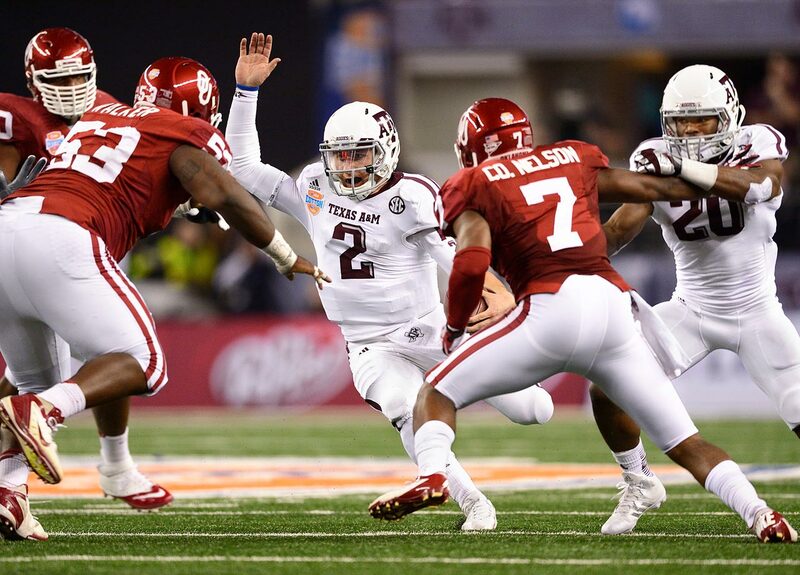 Some went wild when the Cleveland Browns selected Johnny Manziel at No. 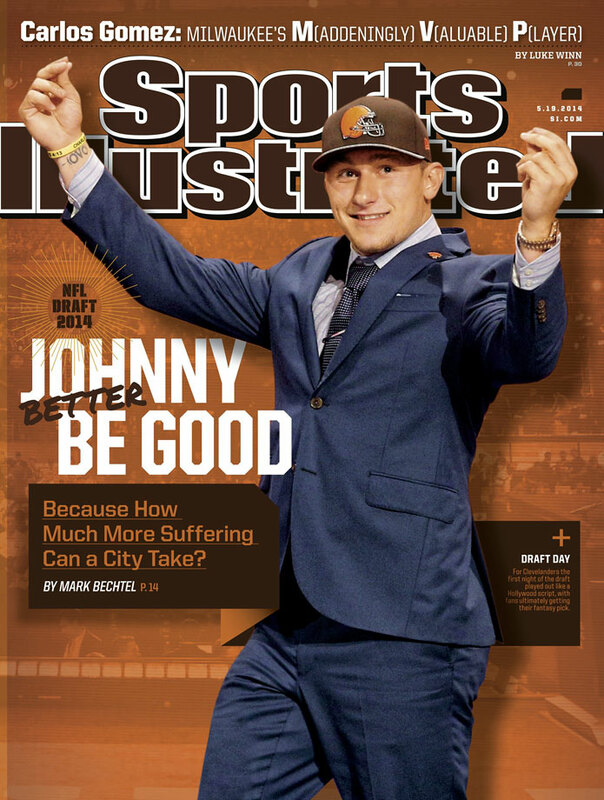 22 overall, but many Clevelanders remained wary of Johnny Football, with that tension detailed in the May 19, 2014 issue of Sports Illustrated. 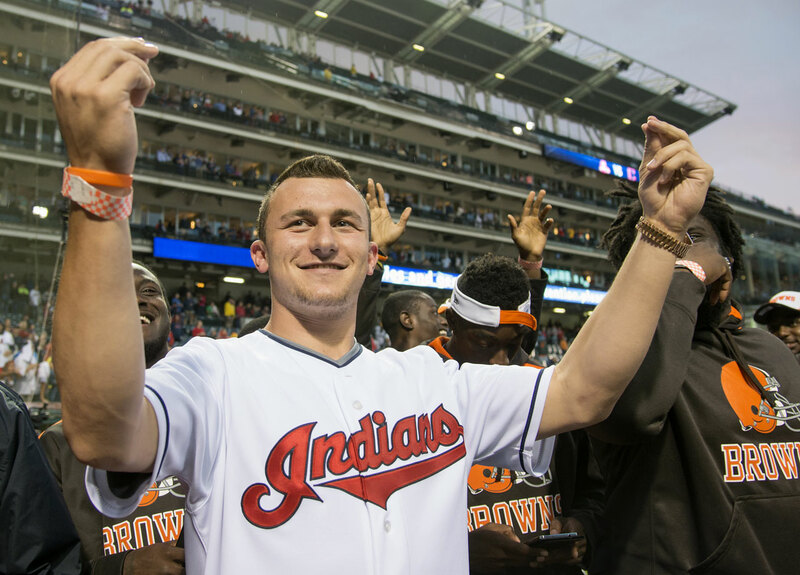 Johnny Manziel acknowledges the crowd of Cleveland Indians fans, along with other Browns rookies, prior to the game against the Boston Red Sox on June 4, 2014 at Progressive Field in Cleveland. 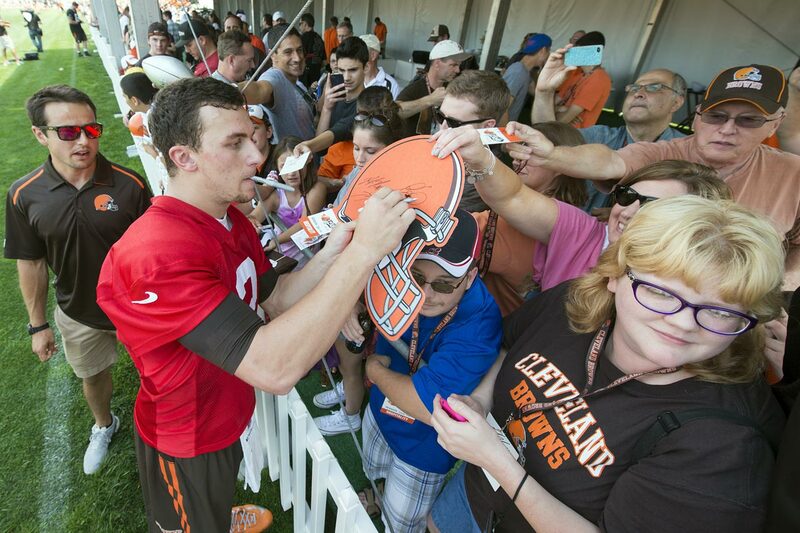 Johnny Manziel signs autographs after practice during training camp at the Cleveland Browns training facility on July 26, 2014. 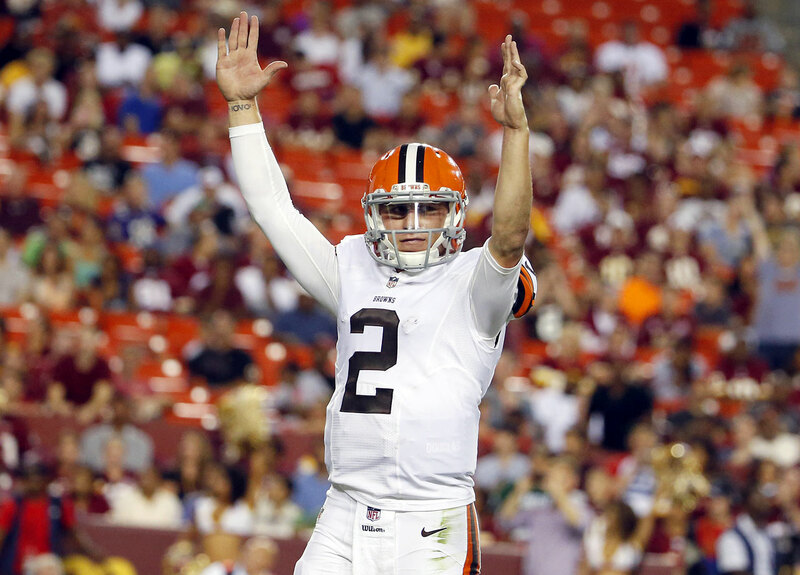 Johnny Manziel celebrates his first touchdown of the NFL preseason, an 8-yard pass to Dion Lewis in the fourth quarter against the Washington Redskins on Aug. 18, 2014 at FedEx Field in Landover, Md. 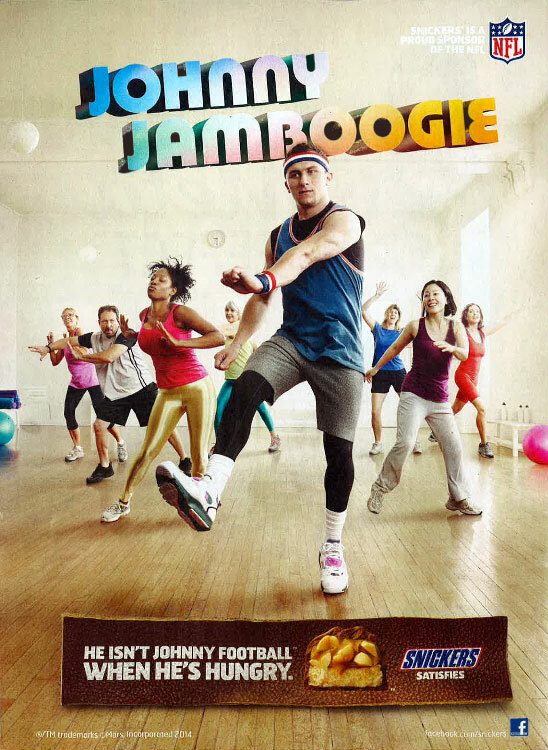 Johnny Manziel's hunger leads him to teaching a Jane Fonda-style aerobics class as "Johnny JamBoogie" in a Snickers commercial, which first aired in late Aug. 2014. Manziel may not have even be a starter yet, but his work here definitely showed he might be coming for Peyton Manning's crown as the NFL's finest pitchman. 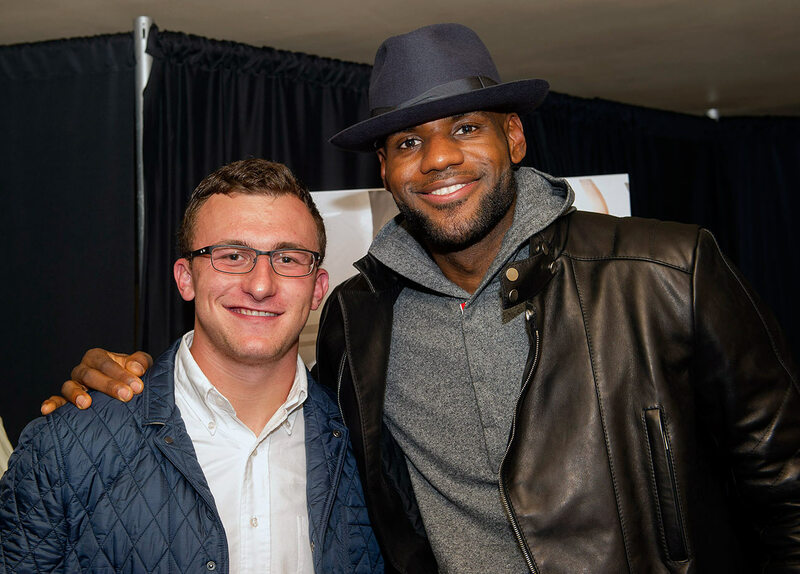 Johnny Manziel and LeBron James pose together at the Starz screening of "Survivor's Remorse" on Sep. 11, 2014 at the Capitol Theater in Cleveland. 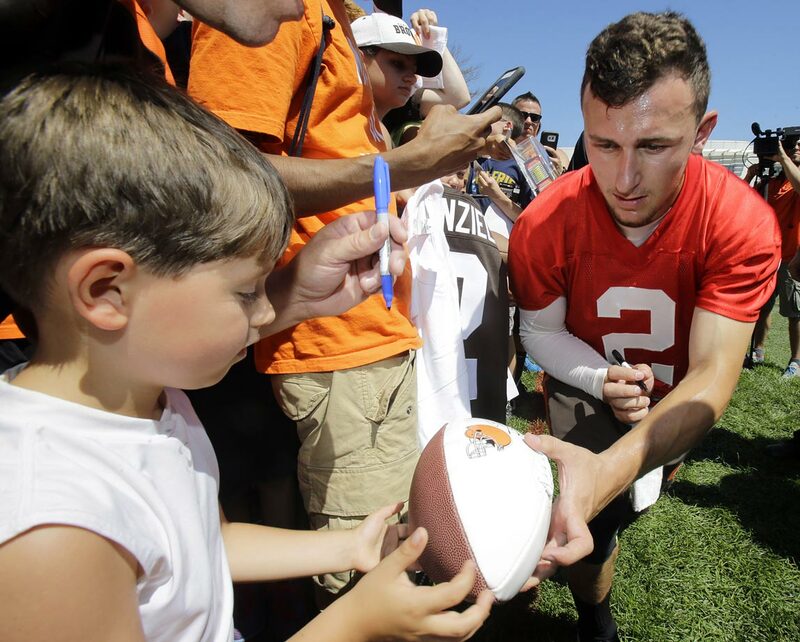 Johnny Manziel scores his first regular season NFL touchdown on a 10-yard run against the Buffalo Bills in the fourth quarter on Nov. 30, 2014 at Ralph Wilson Stadium in Orchard Park, N.Y.
Johnny Manziel hands a football back to a young fan after signing it following practice at the Cleveland Browns' training camp on July 30, 2015 in Berea, Ohio. 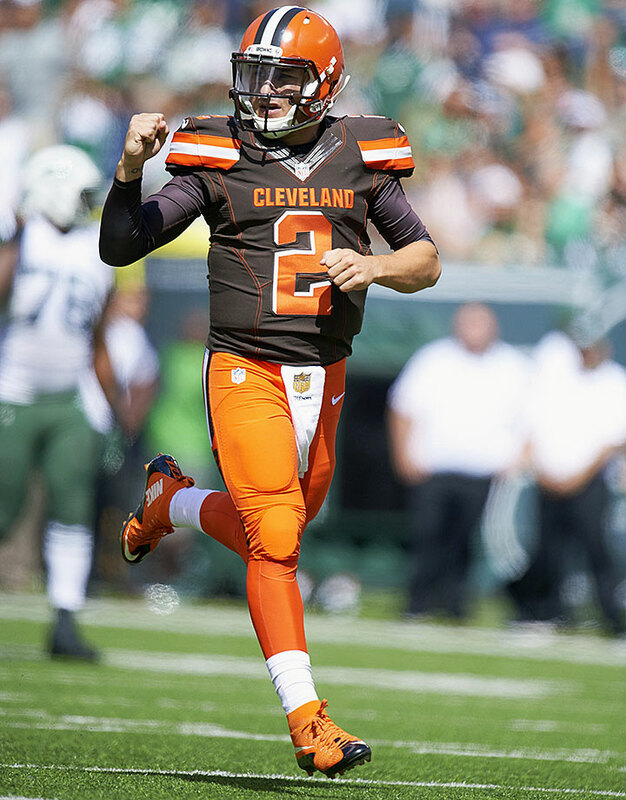 Johnny Manziel celebrates his first regular season NFL touchdown pass, a 54-yard completion to Travis Benjamin, on just his second throw of the day after replacing starting quarterback Josh McCown, who went down with a concussion on the Cleveland Browns opening drive against the New York Jets on Sept. 13, 2015 at MetLife Stadium in East Rutherford, N.J. Manziel had three subsequent turnovers and finished 13-for-24 with 182 yards in the 31-10 loss. The general manager of Metropolitan at the 9 told Cleveland Scene that he had no comment on the incident. According to the magazine, "many" Cleveland professional athletes live in the building. Manziel, selected by the Browns in the first round of this year's NFL draft, has made headlines in the past for off-field incidents. Before his redshirt freshman year at Texas A&M, Manziel was arrested and charged with failure to identify, disorderly conduct and possession of a fictitious driver's license after being involved in a fight. He later pleaded guilty to the former charge. He was fined $2,000 as part of a plea deal and had a two-day jail sentence waived because he was placed in jail after his arrest. 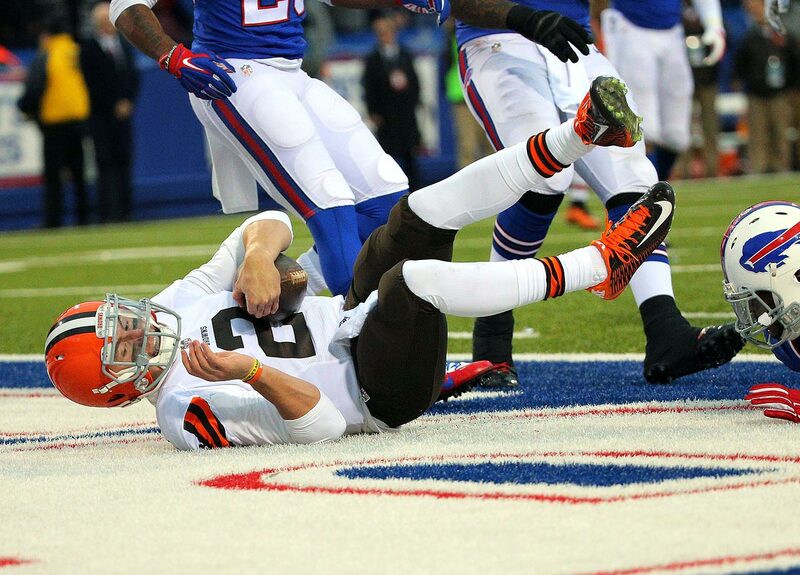 Manziel lost out to Brian Hoyer for the Browns' starting quarterback job in training camp. He has appeared in two games this season, attempting one pass.